Hi Total German Shepherd! My baby boy Jake is currently 15 weeks and 32 pounds! He is such a love everyday, and I am so glad that i got him! Among his favorite things to do are, sleep, play in the snow, go for car rides and did I mention sleep? He is such a sweet puppy, and I am very grateful for all of the comments I get everywhere I go about how cute he is! I hope you think he is cute too! 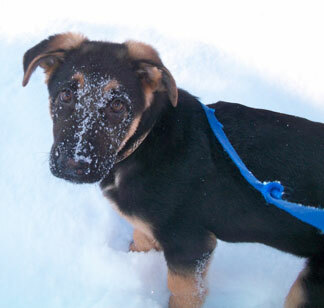 Hello Cathy, and thank you so much for sharing your great story about your wonderful German Shepherd puppy Jake. And I do agree with your statement - "about how cute he is". He is soooo adorable! Hear, hear! It's always nice to hear about all our little German Shepherd puppies out there. And the picture you have sent is just adorable. It's nice to see that your baby loves the snow so much. And the snow on little Jake's snoot is so cute! And I'd like to take the time to say thanks to all our visitors for reading along with us. If you get the chance, please tell us also exactly what you think about the above story by leaving some interesting comments below. My Nonna is the same age. You've got a lovely dog!